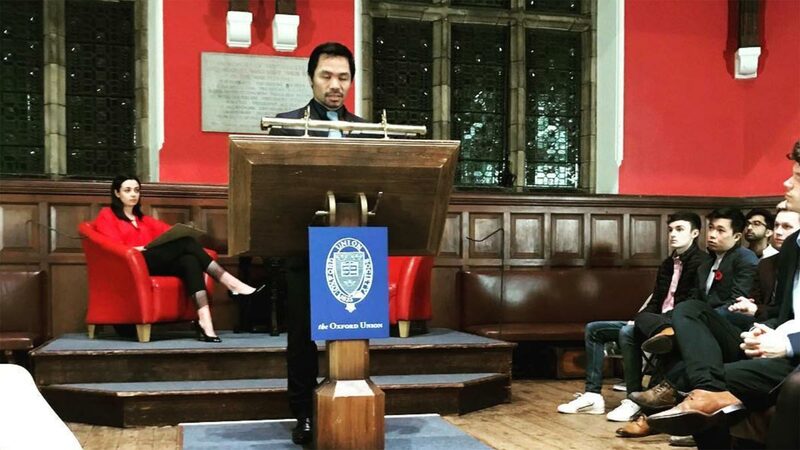 Manny Pacquiao talks about survival and determination before members of the Oxford Union. MANNY Pacquiao talked about his education in the “Open University of Life” even as a student organization expressed concern over the prizefighter's appearance before the Oxford Union on Monday in England. The eight-division world boxing champion urged his audience to never lose faith in God and family in the first of two speaking engagements in the UK — he was also invited to the Cambridge Union. The Oxford Union has had high-profile speakers from all fields from politics to religion, and several from the sporting world. Former football star Rio Ferdinand three years ago gave a talk to the Oxford University’s debating society about sporting excellence, and two years before that Sepp Blatter spoke about being a servant of football and not a dictator. Pacquiao discussed survival and determination. “You, with your education, determination and faith. You can change the world,” he added. However, the student organization Oxford Philippines Society expressed concern over Pacquiao’s appearance before the union, questioning the senator's views on homosexuality and his stand on death penalty, among other social issues. “The Society … would be remiss in its duties if Mr. Pacquiao’s visit to the Oxford Union is not properly put in its context. After all, his invitation into the Oxford Union, which has invited extensive media attention in the Philippines, could appear like a validation of his personal advocacies as a Senator, aside from his career in boxing,” the society said in a statement posted on its Facebook page.